In my last blog post, I wrote about ‘quaint’ being the quintessential word to describe Nantucket. The Rose and Crown, however, is anything but quaint. Walking into The Rose and Crown, I feel like it’s the perfect restaurant for visitors and locals alike; everyone is welcome. The decor is teeming with Nantucket stories. The dark wood, paintings, pictures and artifacts hung on the walls can easily pique your curiosity for an entire afternoon. Ask someone who works there… they know the stories. I went for lunch a few weeks ago with a friends. It was a gorgeous day so we sat at a table where the doors open up from the dining room and you’re almost outside. Al fresco! We were there for a quick lunch – I had a Caesar salad and my friend had the lump crab melt (which she had to eat with a fork and knife), were both fresh and delicious. Their menu is more creative and extensive than what you’d expect to find at a pub-style restaurant. Bottom line is that I need to go back quite a few more times to try other menu items like Clam Fritters, The Hangover (burger), Braised Short Rib French Dip, Lobster Mac & Cheese…mmmmm. It is the downtown restaurant and bar. 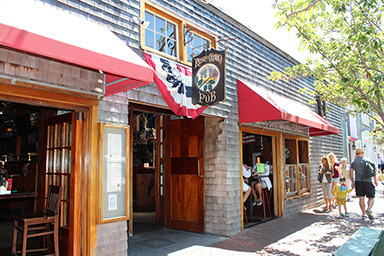 Nantucket’s only downtown nightclub after 10, featuring live local music 7 days a week. Serving a full menu from 11:30 am until 10:00 pm daily, and featuring scratch-made eclectic pub fare. Walk in as a stranger; leave as a friend. I saw a visitor comment using the word “unpretentious” and that, my friends, is the quintessential one word to describe The Rose and Crown. Want to have an amazing meal and beverages at The Rose and Crown? Enter to win our social media contest and select the Nantucket Getaway, which includes a $75 gift certificate!